Category Archives: Revelation awaits for appointed time. REVELATION AWAITS FOR APPOINTED TIME. Greetings to all precious people in the name of our Lord and Savior Jesus Christ.Let grace and peace be multiplied to you in the knowledge of God and of Christ Jesus. Holy Spirit tugged my heart with this message on 09 July 2010, and I believe that He will speak to you also through this article of THE LIVING RHEMA. I believe most of the Christians know this passage very well because we all wait for the promise of God to be revealed in us. There are three kinds of people among us : 1) The people who have heard the promise 2) The people who are waiting for the fulfillment of the promise and 3) the people in whom the promised is already fulfilled. This passage is very important for us to understand few facts which are hidden, which will help us to attain the promise because the one who has promised is worthy to accomplish it. You must understand one truth today that there is a time gap or an appointed time for the revelation to be fulfilled. What is this appointed time ? This is the period between the point of time when you hear the promise till the point of time of fulfillment of the promise. If God has promised, he will accomplish it in his time. So you must wait for his time and not your time. Don’t set your time because your time is already set by God. If you carefully notice this passage, we can separate it into three folds. First, which says that at the end, the revelation will speak; (you don’t need to speak in between but it will speak). Second – it says that the revelation will not lie (because it came from the mouth of God and God cannot lie) and the Third most important point is that the revelation will tarry ; but it will surely come. Now you may say that you understood the first and second part but why does the revelation tarry? 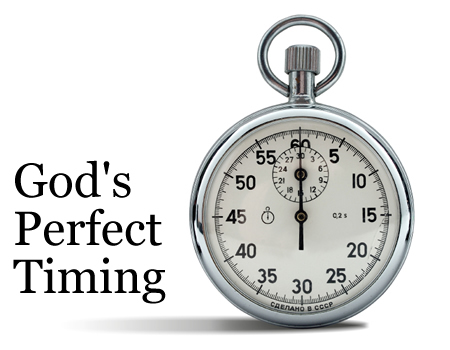 Why God cannot accomplish it faster? Most of the Christians have this question in their mind. The revelation tarries because of two reasons. Let me answer this by the Grace of God. So it is clear that the appointed time is set by God and he sets this waiting period so that we will be mature enough to receive the promise. Illustration: Let us think for a while . A Father has 3 Big Companies. He will never make his 3 year old child, the manager of the company even though the child is the heir and master of that property. Those 3 companies belong to that child but he will receive it when he is mature. A student needs to wait for 1 year to get into the next level. A mother needs to wait for 9 months until the child is matured in the womb. Likewise when we are mature enough to know the will of God, the love of God, the ways of God, the heart of God and wait upon our Heavenly Father patiently like the child waiting patiently under the guidance of his Father, we will surely receive the promise at the appointed time. The fulfillment of promise gets delayed, because God wants us to know his will and grow in him daily until we are matured. Reason # 2 We are responsible for the delay in the fulfillment of the promise. I want to show you this through the Scriptures. The journey from Egypt to Canaan was only three days, but the Israelites took 40 years to reach Canaan. God was not responsible for this delay. The children of Israel murmured against God and his servant. They forgot the fact that when they grieved the heart of God, they were actually delaying the fulfillment of their promises. Why was there a delay in fulfillment of promise in Abraham’s life? Was God responsible for it ? Or was it both Abraham and Sarah who were responsible for it? Do not blame God when you see the manifestation of the promise getting delayed. Either God might be waiting for your maturity or else you yourself might be delaying it. Ask and search yourself. John was banished to the isle of Patmos, not because he was a criminal, but for the Word of God and for the testimony of Christ Jesus. I thank God for those servants of God who are banished like criminals for the sake of the Word of God and for Christ Jesus- there reward is great. John was banished into the island of Patmos which was an open Jail and an open cemetery. Criminals in the Roman era were sent to this Island with no food and water, so that after some period of time, their corpses would fall on the ground and the eagles would eat them. If they escaped the eagles, the jackals with their sharp teeth would eat these criminals alive. Theologians believe that John was put into the boiling oil before he was banished to the Isle of Patmos…The apostles suffered a lot for Christ. They were stoned and put into flames of fire and boiling oil. They were shipwrecked and driven into wilderness without food and water for many months. I am sad that we cannot even tolerate when one of our family member mock us when we receive Jesus. I know a few believers who never say among their family members about their belief in Christ or their baptism. By doing this, they actually play hypocrisy. I would suggest them to read II Corinthians Chapter 11 . Moreover the scriptures says in Mathew 10:32-33, ‘ whoever acknowledges me before men, I will also acknowledge him before my Father in heaven and whoever denies Me before men, him will also deny before My Father who is in heaven. ‘ Let us not be ashamed! We are more than conquerors in Christ Jesus.The skull or the corpses might have told Apostle John that he would be the end of the ministry and that he would be like one of the corpses seen around. But John decided one thing, that he would not see the surroundings and that he would not murmur before God . Instead, he kneeled down in the presence of God. Now Revelation 1:10 says, ‘ I was in the Spirit on the Lord’s Day.’ This is what we also need to do. There were lots of things around John that he could murmur about, but he decided to kneel down before God and so, he was in spirit.See he was not disturbed by the atmosphere in Patmos because he was dining with Jesus Christ in spirit. This is powerful and touching. Your surrounding may sound against your promise but if you decide to dine with Jesus, the waiting period will seem no more long. The things in the Patmos did not overcome the Man of God because he had decided to be in a different realm or movement…that he would be in spirit in the Lord’s Day….Soon after, he was taken up into Heaven and he wrote about the things to come….Yes indeed, the promise awaits the appointed time…John might have thought for a moment that he is in the end of the rope, but God was starting a ministry through him. You must understand today that during the waiting period, the circumstance will be against the promise. This is powerful. So write it in the tablet of your heart. Moses was called to redeem the people of Israel. So here is the truth – the calling on you is not for you. But it is for the Children of God. God chose him for his purpose. God has chosen us for his purpose, not for our purpose. Moses, after 40 years of comfort life in the palace, saw one Hebrew and an Egyptian fighting with each other. He went and hit the Egyptian and buried him that day itself. But when God saw this he said that even though Moses loved the children of Israelites, he was not mature enough to lead them patiently. So he waited another 40 years feeding the flock…Forty years of feeding the flock was necessary for Moses to lead the people of Israel. He waited and at the appointed time he left the flock back in the desert and there, God appeared to him in the mountain of Horeb…God will give you the time to leave that job and take up the yoke of God. Even though he was not patient initially, after the bracket period God testified about Moses in Numbers 12:3 (Now Moses was a very humble man, more humble than anyone else on the face of the earth.). He was matured into that level and this is what God had planned for Moses. We see Joseph in the Holy Bible, who saw 2 dreams which lead into hatred and matter of discussion. If you have a dream and a promise in your life, do not be amazed if your own people hate you…They hate you because of the promise. The devil hates you because you are a promised child. He hated Adam and Eve because he saw God’s blessings and promises on them. Soon they were caught up in deception and fell short of Glory, but God so loved the world that he sent his only begotten Son to this world, that whosoever believeth in him shall not perish but will have eternal life…yet to all who receive him, to those who believe his name he gave the right to become children of God. Joseph did not know initially that behind the dream of shining sun and shining stars, there was a pit of hatred, slavery and Jail. We all like to hear beautiful words of promise from God but remember – There will be bitter ways to teach you and accomplish that dream in you…God did not made Joseph a minister in one day. He needed to cross over the pit experience and the slave experience. He needed to be a bond servant in the house of Pothiper. He had to cross over the jail experience….When you see all these, you might say that Joseph was going down every day, away from the dream . But he was actually stepping up ahead day by day, nearer to the promise…When Joseph was cast into the pit, his 11 brothers were standing like upright sheaves and he was bowing down in the pit. The Devil might have told Joseph that his dream would not be fulfilled because he saw his sheaves upright while in the dream, the 11 sheaves were bowing down…During this bracket period, until the appointed time, you will face the situation contrary to the promise. Joseph was sold as slave but the promise was that he would be the master….but the great thing to notice is that Joseph did not murmur. He kept his patience and was silent because he knew that it was God who had promised him. We, as a family was in a terrible condition in 2008 February. I lost my job and my parents had no visas. We could hear threats from around and we did not have a single penny to pay for our house rent and the loan. The only option for us was to leave this desert. We could feel that God was testing us. All our brethren left us. We three looked at each other and cried out in the presence of God. We fasted for 3 days….God spoke through one prophet in India, whom we had never met nor had heard about. The Holy Spirit through this anointed man, told us that we would be here in the desert for 5 years…Soon after that, within three months, all the three of us got the visas. God gave us room in this desert just like he opened the well, Rehoboth for Isaac .God enlarged our territories. See, if God is telling you to put down something, he wants you to pick up something greater. Oh! The ways of the Lord is awesome!! As soon as we heard the promise that God would not let us go from this place, even though we had tears in our eyes, we were projecting towards the promise.You may be crying, but project your vision towards the promise. It will not tarry. It will surely come. What God has prepared for you, no one can take it…I said no one can take it , not even the devil …it is for you…you only. 4 Comments	| posted in Revelation awaits for appointed time.